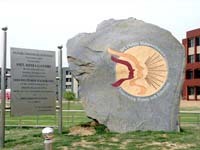 The State Government under the leadership of Shri Bhupinder Singh Hooda, the Honorable Chief Minister of Haryana took cognizance and upgraded the erstwhile Gurukul to the status of a University exclusively for women in August 2006 and christened it as Bhagat Phool Singh Mahila Vishwavidyalaya, which happens to be the first State Women University of North India. 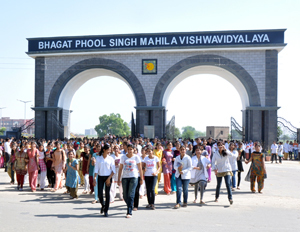 Since then BPSMV has undergone a complete transformation; a 75 years old Gurukul started with only three girls has turned into a modern university with approximately 7000 girls on its rolls studying in various programmes. The university is spread over lush green, pollution free 500 acres of networked & safe campus, juxtaposing tradition with modernity. The first State Women University of North India providing education from KG to PhD level. The university has established the Centre for Society- University Interface and Research (CSUIR) which offers innovative programmes like Integrated Energy Resource Management, Micro Finance Practices, and Folk Medicine etc. BPSMV is the first and only Indian university to establish UGC Area Study Centre for Indic-Asian Studies. The University offers innovative, job oriented programmes in various disciplines. The university has established state of the art Language Labs and Staff Training and Research Institute for Teaching of English. The university has signed MOUs with many foreign universities of repute. Free placement and personality development assistance is provided to all the enrolled students. The university organsied Women Youth Parliament to hone leadership skills of students. The university has implemented all the good practices pertaining to academic, sports and cultural areas.